Cut yarn leaving about a 12” tail, and attach darning needle. Secure the last stitch, and put the cast on edge next to the bind off edge, and stitch closed the top 1/2 inch of the seam. 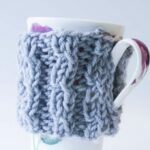 Weave the sewing yarn down through one side of the seam, leaving a nice little gap for the handle of your mug to fit through. Stitch the remaining 1/2 “ of the seam. This project for How to Knit a Coffee Cozy was printed from CraftsbyAmanda.com - https://craftsbyamanda.com/coffee-cozy/ and can only be printed for education or personal use.